My nephew has been using lately. He is 14 but small and only pulls around 35lbs. Shot several hogs, a texas dall and a mature whitetail buck. Most all the decent broadheads will be fine. I think shot placement is most important over anything else. I have killed several deer with cheap Allen broadheads from Wal Mart. Cut on contact best for low poundage with two holes being the goal IMHO. Magnus makes some fine ones too that have served me extremely well. Get her to shoot the chosen broadhead a few times, accuracy kills. Have fun! I use the cheapest ones I can find at Academy. They all pretty good nowadays. With out know her set up I’m going to wing it. When low draw weight is in play then we have to look at a lot of variables. And even if you have an arrow you think is the best it still can fail. Low draw weight means you need a heavier arrow. I would look at 10 gr per lb minimum. That means she must get close. And that may be 10 yards. Never look at a mechanical head. Yes I know everyone wants to say I’ve done it. Ok. But your trying to set up an arrow with the least amount of failure problems. Like at cut on contacts. This is heads that the blade is the tip. Look at two blades with bleeders. Stingers are good for this. Build the arrow with foc. Short arrows are not as stable. This is why for the foc and it imprices penetration. Last she has to practice and tuning is very important. This is also very hard for kids. But if the arrow hits an animal and the nock is not in line with the tip it Impedes penetration. And with low draw weight it’s even worse. these are pretty wicked and very tough I haven't broken one yet. this is what I went with 100 grain she is pulling 35 pounds right now trying to get her up to 40 she has a 24 inch draw we should be right around 30 on the kinetic energy and going to try and keep her within 15 yards. Last edited by lk05077; 08-01-2018 at 08:20 AM. Lots of good answers here. Maybe it was mentioned and I didn't see it but make sure her bow is tuned as well as possible. If the arrow isn't flying well she will lose energy and penetration. Good luck to her this season! Never used stingers but I think your choice will do just fine for her. What every you do don’t shoot a mechanical!!!!!! I would suggest any of the slick trick fixed blades. I’ve had really good luck with the slick trick magnum but that’s out of a 70 lb. triax. I would shoot her field points with broad heads..... the broad heads reveal arrow flight problems quicker. If your broad heads and field points are impacting the same at 20, 30 and on then you are getting good arrow flight usually. My girlfriend got her first deer this past season shooting the NAP Thunderhead Nitros. She is pulling about 38lbs if I recall, and we got a nice pass thru at about 18 yards, and the deer was down in probably 75-100 yards. I think you made a fine choice with the stingers. I just walked in from testing various broadheads and fletchings at 80 yards. I brought some stingers just to see how the fletchings handled fixed blade heads in a little bit of wind. I was surprised at how well they flew. The flew as good as any head I’ve ever used. At 80 yards I could hold a 4” group with them when I did my part, which is as good as I can hold the bow so they are shooting as good as field points out of my rigs. I think that’s impressive for an affordable fixed blade head. I’ve decided to take them out and shoot a few critters with them this year along with my other heads and see how they do for me in the field. I haven’t tried the stingers but thinking about letting my wife use them for the same reason. I really like the slicktrick magnums because they are consistent and sharp. I killed a bunch of deer as a kid shooting thunderheads. Never had an issue. I think the biggest thing is just to make sure you constantly touch up the sharpness of your blades. too many times people forget this from taking them in and out of your quiver. I personally shoot the slick tricks 100 gr. and have nothing but great success. They always fly true and are extremely sharp. I can't wait to see what she gets this year I have had such a great time shooting with yall at the all the Deerman. Happy huntings! Spitfire all day but with a low poundage bow I would go with a muzzy fixed blade. 100 gr ramcats. BAD TO THE BONE!! Got a new Sniper 370 xbow. I have it set to 20/30/40 with 100g field points. I tried shooting a slick trick at 20 and it was low and to the right by 6 inches or so. Do I need to sight the bow to broadheads or any other tuning involved? Slick trick is stuck in the target, will have to try a foam target. I like the thunderheads best. Using Muzzy thus year but they are a pain to put together. I like the quivers that have the two spots that grip the shaft and an open hood with no foam for this reason as well as you don't have to be as careful with how you insert mechanical heads. saw those or similar online, would love to try as well. Wicked! that is a silver flame from grizzly stiks. that one is a 200gr. and I believe 1 7/8 cut. 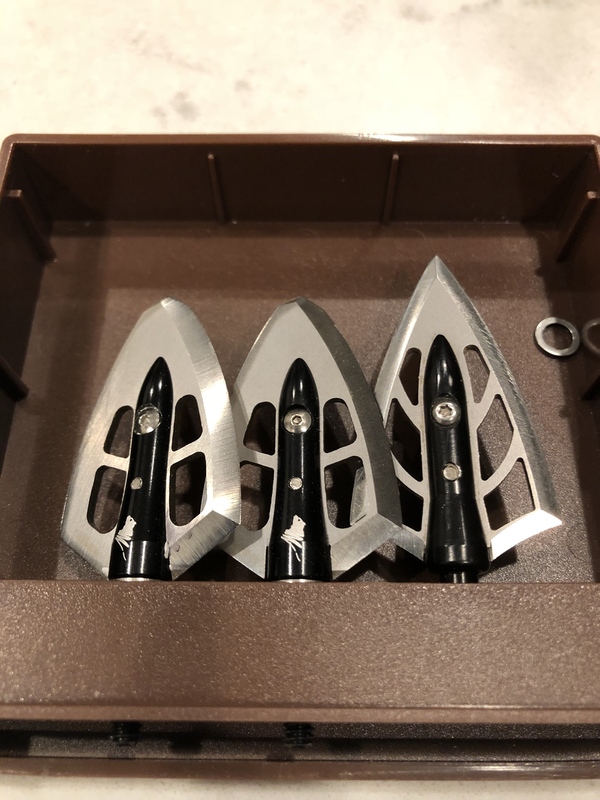 Picked up a couple of new broadheads to try. 150 grain Grizzlystiks Maasai single right bevel and 150 grain German Kinetics. You made a good choice with the stingers. I would never pay for another Ramcat. Out of a single pack you may or may not get consistency. There quality control is horrible, along with their customer service. I have provided several examples of broadheads weights varying by nearly 20%. 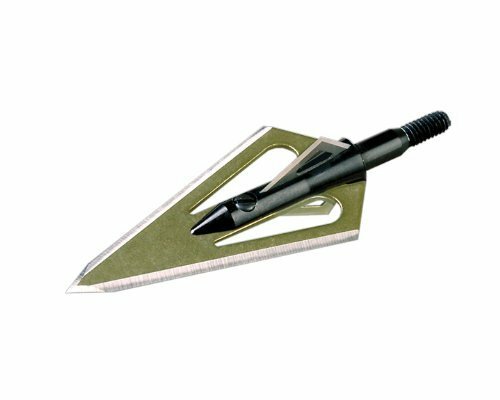 Wasp makes a couple of broadheads for low poundage bows and they are excellent. Clean pass throughs and massive blood trails. If you want a pic or vid of the blood trail let me know. Don’t think you can beat the Stinger, Exodus would be a close second but is not true CoC. And you can get those Stingers sharp enough to make you bleed just looking at them.